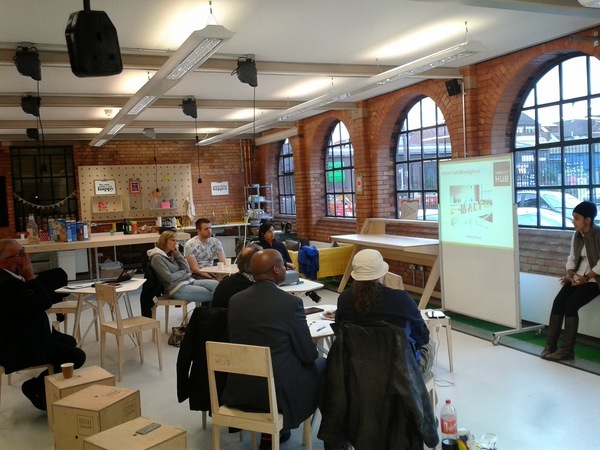 Net Squared Midlands, the local branch of the global Net Squared network which organises events for anyone interested in the connection of technology and social impact, held its first event in the Midlands at the Impact Hub Birmingham on Wed May 6 2015 as part of the Hub’s launch festival Demo B. Members and guests heard about Net Squared and its global mission, and the other local branches in the UK. Immy Kaur, Hub co-founder, also gave an insight into how the Hub was started and the success of their crowdfunding campaign. Local Net Squared Midlands co-organisers, Pauline Roche of social enterprise RnR Organisation from Birmingham and Paul Webster digital connector from Mansfield, gave short talks about some of the work they do around tech for good in the voluntary sector. As well as the pair co-organising the national VCSSCamp unconference for infrastructure organisations, Pauline spoke about open data and her involvement with networks and events Open Mercia, West Midlands Open Data Forum and Open Data Camp while Paul spoke about his work on the LASA Connecting Care project. Local Birmingham techy members recommended that the organisers publicise Net Squared Midlands on the new Birmingham discussion forum for all techy people Birmingham IO which Pauline has done. Her post there has had 41 views already. Paul and Pauline explain that whether you are a not for personal profit organisation in the traditional sense, a venture capitalist, a programmer, an individual with a great idea, or a social changemaker, NetSquared Midlands is here to help you make connections and add to the community around innovating for good in the Midlands. They say that these events are great opportunities to learn what others are trying, see successful projects and platforms, hear about developing technologies, make new friends and collaborate on new projects. 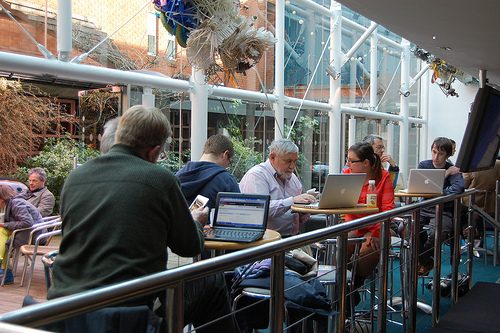 The next event is being planned for September 2015 but in the meantime, members and others are being encouraged to use the Net Squared Midlands meetup page for dialogue and suggestions. Data and open data skills for Birmingham community and voluntary groups at these Social media Surgeries. First published on the Social Media Surgery blog. Could your community group or charity be more effective if you collected information in different ways, used it better, shared it with the right people? Would it help if you could more easily find information that government has about the places or perhaps the people you are trying to help? We are experimenting in Birmingham with how we can use the social media surgeries to share not just social media skills with local community groups and charities, but also data skills. As always we start with you and your group. What are you trying to achieve? What skills and tools do you have at the moment? Can we show you new ideas that could help you achieve more? Can we help you in practical ways use those skills and tools – there and then? Always the same relaxed approach of a social media surgery. Our ultimate aim is to encourage more community groups and local charities to find good uses for Open data. This is numerical information that government shares in public, so we can have a better understanding of the places we live in and the way government works. But we won’t throw you into anything difficult, we’ll start where you are and help you with the numbers and skills that matter to you. Is there any information online? As we work with people we’ll learn together how to solve problems. We’ll describe what we’re doing and share it here on the blog. We will also be writing about things that might help you, tools, sites where data is stored, examples from other organisations. I have no idea what you mean when you say open data! Sorry – it is jargony. Open government data is when government shares information on the internet that it owns and grants you and I permission to use it (using an open government license) A simple example is local government releasing a monthly list of all spending over £500. You can find the Birmingham one here. But don’t be phased by any of this – we want to help you develop the understanding and skills that might be useful for what you are trying to achieve. Memrica; a tech start-up based at the Innovation Birmingham Campus is developing a mobile aid for people with memory problems, including the early stages of dementia. A grant from Nominet Trust, the UK’s leading ‘tech for good’ funder has been awarded to develop the first roll-out of the app, which is called ‘Memrica Prompt’. Designed to reduce the anxiety and frustration caused by forgetting essential information, it creates a virtual link between the things people want to remember and the objects and people around them. It also offers a smart reminder system, which collates data, image and voice files to prompt the user about day to day tasks and appointments. By increasing confidence and prolonging independence, the app is designed to delay the need for more extensive health and social care, and reduce stress for families and carers. The tablet and smartphone app is being designed and developed in collaboration with people with dementia, their carers and clinical experts. A pilot population of those with early stage dementia –particularly people under 65, who enjoy using smartphone and tablet apps and already have an iPhone or iPad – is now sought to test the app. Mary Matthews, Founder of Memrica said: “44 million people worldwide live with dementia and this number is expected to triple by 2050. Eight per cent of those diagnosed with dementia are under 65. However, when it comes to using technology, research from Deloitte suggests that by 2020, the gap between smartphone and tablet usage for the over 65’s and younger generations will be negligible. The Memrica Prompt app is expected to launch to the public this summer. Organisations that have already had input into the development of Memrica include Young Dementia UK, Heart of England NHS Foundation Trust, Worcestershire Early Intervention and Manchester Early Onset Dementia Services. Memrica is one of the tech start-ups on Innovation Birmingham’s Entrepreneurs for the Future programme, where the Entrepreneurs in Residence have assisted with the development of the business plan. The Entrepreneurs for the Future (e4f) business incubation centre, provides bespoke mentoring and business planning to achieve investor readiness, as well as free telephone usage, 20Gbit/s broadband and office space for nine months; a package which has a monetary value of £10,000. Part-funded by the European Regional Development Fund, e4f is unique to Birmingham and is specifically designed to harness and support the city’s burgeoning tech community. To participate in the trial of Memrica Prompt, please email Mary Matthews, founder: mary@memrica.com. Majestic –Innovation Birmingham Campus’ largest tenant – has come second in the Midlands, and 17th overall, in the Deloitte Fast 50 awards programme, which took place last night. In five years, the web index creator’s turnover has grown by 1,571 per cent. Majestic’s web index is far larger than Yahoo’s ever was, being the largest global commercially available link index available. Its client portfolio includes some of the best known international technology brands, who use the Topical Trust Flow product to rank and analyse the influence of all online web and twitter pages. Having been based at the Innovation Birmingham Campus since its inception, Majestic has just expanded the size of its office to over 3,000 sq ft, to accommodate its growing team of 20 and suite of servers. Majestic’s groundbreaking specialist search engine has been designed to categorise the entire World Wide Web, eradicating the need for manually categorised website directories. Its purpose-designed technology continuously crawls the web in order to map links between websites. Over seven hundred billion web pages – including all Twitter accounts – are filtered into 800 topics to enable easy analysis and comparison. Trust Flow scores are also provided, where higher rankings are achieved by having links directly relevant to a web page. Majestic’s search engine is multi-lingual and enables analysis of the web to be fully automated. For organisations that want to boost their own web presence, it provides clear results as to which sites are more influential to link to, without actually viewing any web pages. Dixon Jones, Marketing Director of Majestic said: “Our company has experienced considerable growth because we are passionate about creating brand new technology for a global audience. Being recognised in Deloitte’s Tech Fast 50 awards is a great accolade for Majestic, especially since we’ve ranked higher than well-known brands such as notonthehighstreet.com, Just Eat plc and Sky Scanner. Topical Trust Flow is designed to assist outreach and inbound marketeers, advertising strategists, PR professionals and business analysts. When comparing two of the world’s most influential Twitter accounts; Lady Gaga and Barack Obama, there is virtually no overlap in the topics that they rank most highly for, but their overall Trust Flow scores are very similar. For advertisers, the new search engine can decipher the topic of every web page, so can inform which messaging is likely to be most effective to the audience. Innovation Birmingham’s fifth annual LAUNCH Future Gaming & Digital Conference has attracted a large delegation of gaming and ICT professionals from across Europe. The delegation has been facilitated by the BOO-Games project, which unites and promotes the gaming industry across nine countries in Europe. Taking place at the Innovation Birmingham Campus, the focus of Thursday 20th November’s conference agenda is ‘Grads In Games – Launch a Career’, which is run in conjunction with gaming recruitment specialist Aardvark Swift. Friday 21st’s conference theme is ‘Develop Inspired’ to harness the burgeoning community of indie games developers located within the region and beyond. In addition to the European delegation, LAUNCH has attracted registrations from over 20 universities and colleges from across the UK. Over 300 people will attend the two-day event, which will showcase some of the biggest names in digital gaming. Speakers include Lee Stott, Technical Evangelist for Microsoft UK; Kyle Jobson, Video Game Producer for Flix Interactive; Richard Semmens and Jafar Soltani of Microsoft Rare Studios; Helana Santos, Lead Programmer for Modern Dream; Jason Fielder, CTO of Exient; Oscar Clark, Everplay Evangelist for Unity Technologies; Chris Sterling of Worldweaver; Paul Norris, Creative Director of Mad Fellows; Charu Desodt, Senior Producer of Microsoft’s Lift London studio; Ant Thomas from Marketing Birmingham; Cliff Dennett, CEO of Soshi Games; and Trevor Williams, COO of Playground Games. Pia Pearson, Digital Marketing Manager and Head of LAUNCH at the Innovation Birmingham Campus said: “The LAUNCH Conference and regular events programme is one of the largest activities of its kind for the UK’s digital gaming industry. This is the fifth year for LAUNCH, and over that time we have delivered over 40 highly engaging events for the digital gaming industry, ranging from meet-ups and studio showcases, to the annual Meet The Games Press event and this – the flagship two-day LAUNCH Conference. The universities that will be in attendance for the ‘Launch a Career’ day include those with specialist digital gaming and computer science departments such as the University of Northampton, Staffordshire University, De Montfort University, University of Birmingham, and Birmingham City University. The LAUNCH Conference will provide delegates with an insight into the industry’s latest innovations, trends, online tools, computer games, mobile products and services. Delegates will also be able to get hands-on with cutting-edge technology via the interactive exhibition, which will feature a dedicated showcase for gaming start-ups to demonstrate their latest creations. Coventry University’s Serious Games Studio has signed up as a partner of Innovation Birmingham’s LAUNCH event series for digital gaming and mobile app developers. LAUNCH is the biggest event programme of its kind outside of London, connecting and supporting the region’s burgeoning digital gaming sector. The highlight of the annual programme – which is now in its fifth year – is a two-day conference for over 300 indie games developers, held during November at the Innovation Birmingham Campus. The Serious Games Studio has signed up as a partner ahead of the conference on 20th -21stNovember 2014, in order to promote the ERDF funded support available to West Midlands-based gaming companies needing to develop a proof of concept. Features of LAUNCH’s November conference include a ‘grads in games’ programme by industry recruitment specialists Aardvark Swift, as well as a dedicated session from Microsoft on cloud gaming. Pia Pearson, Digital Marketing Manager and Head of LAUNCH at the Innovation Birmingham Campus said: “Working alongside Coventry’s Serious Games Studio is a natural expansion of the LAUNCH programme and a great way to promote the support on offer to indie games developers based within the West Midlands.